Can you buy a car with a credit card and earn miles? Can you buy a car with a credit card? If you’ve been in this miles and points world for more than a few minutes, you might have found yourself wondering how to go about earning miles on a car purchase. I recently found myself in the market for a car, and that prompted me to figure out how to maximize my mileage. When I was in my late 20’s, I won a big poker tournament that I’d paid $15 to enter; with part of my windfall, I bought my dream car: a 1996 BMW Z3. I drove it for six months and then sold it for a small profit. When I sold it, I said that I’d driven my dream car and could spend the rest of my life driving whatever is cheap and reliable. For about the past 7 years, that’s meant a Toyota Yaris that we bought used on eBay for $5500. Forty miles per gallon on the highway and nothing but regular maintenance in cost has treated us well. But we recently added to the family and realized we were going to need more space. We decided to upgrade to either a new or late model SUV. As this would be one of the largest purchases we’ve ever made, I had miles on my mind. Having spent years planning for the start of a family, we had saved up the cash to pay outright for the car we wanted. That’s a key piece of the puzzle in earning miles for a car purchase: if you’re going to use a credit card, you have to be prepared to pay it off. If you’ll be paying credit card interest, there are no miles in the world that are worthwhile. With the cash in hand to pay for the car, I went about finding ways to earn miles for the purchase of a car. Having Googled how to earn miles for a car purchase, I’d long ago read Richard Kerr’s piece at The Points Guy. Richard had bought a new car and paid in full on his Amex Platinum card. It’s a great story that’s worth a read — but ultimately, it was a YMMV (your mileage may vary) situation. However, a piece of that story that stuck out was the Amex Auto Purchasing program. I’d seen this advertised under the list of benefits on my SPG credit card before (but I’d mostly ignored it). Clicking through to learn more, it prompts you to visit amexnetwork.com/auto, which just brings you to a Amex-branded version of TrueCar. If you’re not familiar with TrueCar, the one sentence explanation is that it’s a site that shows you the averages of true prices that others in your area have paid and shows you pre-negotiated prices with a number of dealers. The Amex-branded version works exactly the same as TrueCar.com: You put in the make, model, and your zip code. ]If you want to view actual pricing on local inventory, you’ll have to enter your name, address, email, and phone number. I did this many times. Pro tip: don’t use your real phone number. I used a Google Voice number once — and within about 90 seconds of hitting submit, my phone started ringing. For the purposes of shopping around, you could really use any name, address, and phone number you want as long as you use an email address you can access. You’ll then see some local vehicles that may or may not match what you’re looking for in terms of options. More importantly, you’ll receive emails instantly or within a few hours from local dealers who participate in the program. During my search with the Amex Auto Purchasing program, I was only searching for one type of vehicle and I found a few dealerships willing to take the full purchase price on a card. None of those dealers were near me. I had cast a wide net since I was willing to fly somewhere and pick up the car if the deal had been right. That required filling out the Amex Auto Purchasing form again and again with addresses in different zip codes. But I can confirm that when Amex says some dealers take up to the full purchase price on an Amex, those dealers do exist. It’s an easy process. This would save time if you’re busy and don’t have the time to dedicate to shopping and negotiating. The dealers come to you. You’ll get a billion emails — both initially and then daily from sales reps hoping to help you make a decision. I suggest using a throwaway email account, because the emails don’t stop no matter how many times you don’t respond and how many months go by. The good news is that you can shop in your PJs. You can potentially earn a decent haul of miles/points. A note on that last bullet point: an auto purchase could potentially be good for hitting a large minimum spend. For example, the welcome offer on the SPG Business card recently increased to match its all-time high (see the current offer here). If you’d otherwise have trouble meeting the minimum spend, this could be an easy way to do it and earn both points on the cost of the car and a big bonus (provided of course that you have a high enough limit to charge the cost of the car. I’d suggest a call to Amex to let them know what you’re planning before making a huge purchase on a brand new card). While the best public offer on the Business Platinum Card is currently 75K points after a total of $20K spend in the first 3 months, I received a targeted offer a few years ago to earn a welcome offer of 150K points after $20K spend in 3 months. Keep in mind that this card earns 1.5x on purchases of $5,000 or more. There are a number of other possibilities as well (see below for some examples). If you’re looking at a dealer that only takes $2K-$5K, you probably don’t need the program — many dealers will take a few thousand as a down payment on any credit card. The Blue Business Plus. Earn 2x if you’re within your first $50K in purchases. Potential total = 60K Membership Rewards points (+10K if you’re signing up right now with a referral link — see: New 10K offer on 2x everywhere card). Everyday Preferred. Earn 1.5x if you do at least 30 transactions in the month. We maintain a Manufactured Spending Complete Guide with tips for how to increase your credit card spend. One way some people do that is by purchasing PIN-enabled Visa or Mastercard gift cards and then using those cards to purchase money orders. This method is highly variable depending on location: many places that sell gift cards may not accept a credit card as payment; some places that sell money orders will not accept debit cards as payment; some card issuers may not award signup bonuses, regular spending points or cash back on gift card purchases (See: Amex fires another shot in their war on gaming, Alliant paying 0% cash back at Giftcards.com). However, let’s say you live in an area where this is possible. In that case, you could use credit cards to indirectly pay for a car (or any purchase of course). Let’s say for example that you pay an activation fee of $5 per $500 gift card and a money order fee of $1 per $1,000 money order (YMMV — this could be higher or lower depending on your area, what kind of cards you buy, promotions, etc). In total, you’ll pay $330 plus time and gas on top of the purchase price of the car in order to use this technique. Arguably the best thing going for this technique is the last bullet point. With most signup bonuses requiring around $3,000 in spend, you could potentially knock out somewhere around 10 signup bonuses with a $30K vehicle purchase. Of course, that requires opening ten cards. That might require time and certainly requires planning. Of course, if you have the money saved up to purchase your vehicle, you could take your time and do this over the course of months or longer. There’s much higher risk. Amex has been known to deny signup bonuses based on gift card purchases. There’s the potential for triggering Amex Financial Review or Chase Financial Review based on sudden large gift card purchases. This certainly isn’t an impossible technique. In fact, I did consider this method. It certainly could be well worth the trouble if you’re able to knock out some good offers. But this technique certainly isn’t for everyone and isn’t as safe and simple as the Amex Auto Purchasing Program and technique #3…. I think the most realistic way to figure this is based on earning the maximum number of signup bonuses. Of course, there are tons of different signup bonuses on our Best Credit Card Offers page. You could mix and match a variety of cash back offers, transferable points offers, hotel points offers, etc. However, since this post is about earning miles for a car purchase, I decided to just go to our Top 10+ Airline Credit Card Offers page. I went through the list, excluding Amex cards (since they are known to deny the signup bonus based on gift card spend) and I added up the signup bonuses available on the other top airline card offers until I got to $30K in required spend. I didn’t want to go over $30K in required spend — though as shown above, your actual cost via this method would be $30,330 plus gas. There are two airline credit cards in the top 20 that currently offer signup bonuses after first purchase (The Avianca Vuela Visa and the Barclaycard Aviator). I got to $29K in required spend on eight other cards and assumed you’d split the final $1,330 spend over those two bonus-after-first-purchase cards. Assuming no bonus category spend (i.e. figuring 1x on the $30K), you would have a total of 590,000 airline miles if you were able to open the cards with the best non-Amex airline card offers that add up to $30K. We value most airline miles at 1.4 cents each (read more about why: Airline Miles are worth 1.4 cents each. A simplified approach to Reasonable Redemption Values. ), making that pile of miles worth a reasonable value of more than $8,000 (though you could certainly get more value). I didn’t spend too much time considering realistic logistics; for example, there might have been more than 5 Chase cards that are subject to 5/24 in that list. Real-world results may vary a bit — suffice it to say that you would have a lot of miles with this technique. But it carries risk of shutdowns, lost gift cards, etc. If you’re not experienced in manufactured spend, I highly recommend you tread lightly here and do more researching/reading before going after this. For example, what happens if you buy a $500 gift card and get home from the store and it has a $0 balance? You’d want to know the answer to questions like that before you spent $30K. Ultimately, I settled on a third method I hadn’t considered initially. I’ve long known that Digital Federal Credit Union (DCU) offers cheap auto loans. At the time of writing, they offer a best rate of 2.49% interest for up to 65 months whether you’re buying new or used. Side note: Digital Federal Credit Union sounds like something I just made up with a few hip Silicon Valley venture capitalist friends. It’s not — DCU started in 1979 as a credit union serving workers of a company called Digital Equipment Corporation. These days, branches are all located in Massachusetts and New Hampshire, though anyone can join by making a $10 donation to an affiliate organization. Rates have actually gone up a bit. When we purchased in January, the rate was 2.24% — but even at 2.49%, that’s a very low rate (especially if you’re buying used or refinancing). If you’re looking at that number and thinking that it’s low enough that you could use a credit card and potentially come out ahead, you’re on to something — though remember that even if you used a card that earns 3% back in the first year (like the Alliant Cashback card or a Discover IT Miles card), you wouldn’t be ahead of 2.49% APR due to compound interest. However, it is possible to earn some miles or cash back that potentially beat the cost of interest with Plastiq. Those unfamiliar with Plastiq will want to see our Complete Guide to Plastiq credit card payments. In a nutshell: you can pay Plastiq with a credit card and they’ll send a check to a company on your behalf. Plastiq charges a 2.5% fee for credit card payments. Plastiq also runs a pretty generous referral program. For every person you refer who pays $500 in bills through Plastiq, you’ll earn $1,000 in “fee-free dollars” (i.e. one thousand dollars of credit card payments where you will not be charged the 2.5% fee). After your friend has made $500 in payments through Plastiq, he or she will earn $500 in fee-free dollars as well. If he or she makes exactly $500 in credit card payments at 2.5% and $500 in fee-free payments, that comes to a net cost of 1.25% on $1,000 in payments. That’s not a bad deal for $1K in spend. In fact, if you have friends who will owe or want to pre-pay income taxes, it beats the rates on the official payment websites (See: Complete Guide to paying taxes with a credit card). I’m not positive that making a debit card payment for the first $500 would trigger the referral bonus — but debit card payments only carry a 1% fee, which would drop the net fee for the first $1K to just 0.5% if that works. Note that Visa and Mastercard gift cards do not run as debit trough Plastiq. I happen to be in the very fortunate position of writing here at Frequent Miler, where I’ve been able to share my Plastiq referral link a few times. I’ve earned enough fee-free dollars to pay for my car without any credit card fees. While my situation is certainly unique in that regard, I think it’s not altogether unreasonable for most people to find 5 or 10 or 15 people who might be interested in paying $1K in taxes on a credit card (split into two separate $500 payments) for a net fee of 1.25%. Paid on a simple 2% cash-back card, that’s a net win for your friend — coming out $7.50 ahead of the fee overall. Do you know 30 people who would be interested in Plastiq? Maybe, maybe not. On the flip side, perhaps you’re looking for a car that only costs $10K or $15K or $20K — you may not need to refer so many people to get the fee-free dollars you need. For the sake of the example, let’s say that you were able to refer 30 people to Plastiq and you therefore had $30K in fee-free dollars. Could you just charge $30K on your card and have Plastiq cut a check to the dealer? Maybe. I asked Plastiq that question and didn’t get a definitive answer. However, I decided that I didn’t want to do that. Financing through DCU would work out better. As I mentioned before, because of compound interest, it’s not quite as simple as paying with a 3% card and coming out ahead. 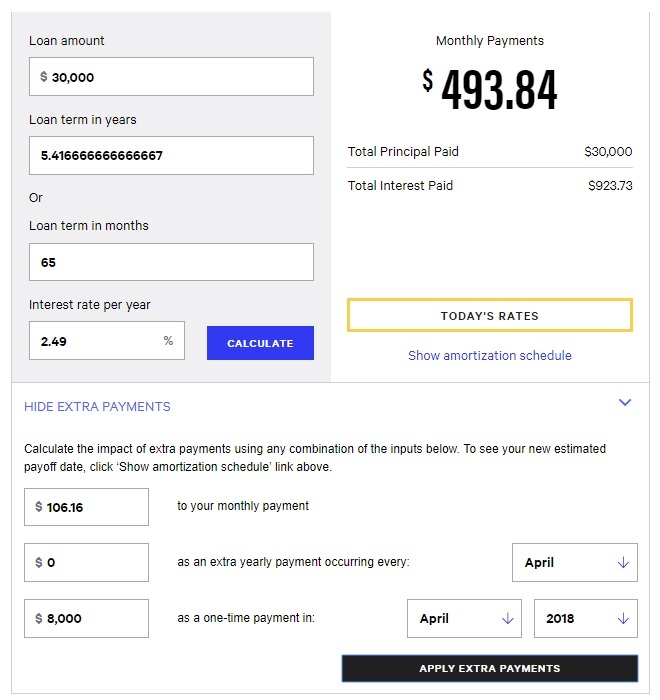 Using a loan calculator, we can see that if I financed $30K for 65 months at 2.49% interest, I’d pay a total of $2,099.66 in interest over the course of the loan. The total price paid would therefore be $32,099.66 (ignoring taxes – let’s assume that’s included in the $30K price). Assuming for a moment that you could pay your monthly payment on a 3% cash back card with fee-free dollars for the full 65 months, you’d earn $963.86 cash back. That’s still a net loss of more than $1100 in interest. At this point, the total interest paid would be $916.89. If you paid the full $30,916.89 on a credit card that earns 3% cash back, you’d earn $927.51 cash back. In other words, you would earn a little more cash back than the amount of interest paid. As you can see, I would start with $21,400 and withdraw a total of $22,384 — a net profit of $984. That alone would be more than the interest on the loan. Of course, that’s a bit pie-in-the-sky: I’d lose some of that interest in taxes, most of those high-yield accounts have some hoops I’d need to jump through and minimum balances, so I might not be able to get 3% all the way. On the other hand, I could take advantage of checking and savings account signup bonuses by moving that money to meet balance needs. Of course, there are a number of other considerations. The credit union requires a higher threshold of insurance than the minimum required by law if you buy the vehicle outright. In my case, I would have paid for the same amount of insurance either way — so this wasn’t a factor for me, but it may be for you. Ultimately, I’ll earn roughly as many miles as I could with the manufactured spending technique, but I’ll keep more of my money for longer. I’m sure there are a few other disadvantages I’m not immediately considering. However the advantages outweigh any downsides I could imagine. These aren’t necessarily the only methods for earning miles on a car purchase. In fact, if you want to pay the dealer directly, you should just ask how much they will take. I told one dealer that I am a miles-and-points guy and would like to earn some miles on the purchase of the car. I asked how much they would accept on a credit card — their answer was $15,000. Another dealer told me they wouldn’t take more than $1K on a credit card (even after I told them that another dealer would take $15K). Luckily, I didn’t have to rely on finding a dealer who would take a card; by combining a great rate on financing with fee-free Plastiq dollars, I was able to focus on negotiating the best deal for the vehicle I wanted — while maximizing my mileage on the purchase. When I leased my car last year, I negotiated the all in cost (down payment + monthly fees), then during paperwork they asked how i’d be paying the down payment – I literally just handed them my credit card. Initial response was “Oh…do you have a check?”; I said no, and no pushback from them, $4500 on the CC without a fight or disadvantage in negotiation. Maybe YMMV, but I would’ve walked out if they said “check only”, and im willing to bet they’d chase me down to get my CC to finalize the deal. Nice! I think a lease would also be easy to pair with Plastiq for continued CC rewards. Or have you found another way to pay for it in a CC and earn rewards? Cool! What make is your car? Hopefully I’m not looking for a car in the near future and I may not want to go to the trouble in article if I did. But, THAT was a damn fine article that directly made you no money – yet you took the time to write it anyway. That’s why I keep coming back to read every day. Thanks Nick. I’ve used PenFed credit union multiple times and they consistently offered the lowest rates in the market (currently it’s 2.20% APR). Great customer service too. Of course, if you’re quickly paying off the loan with Plastiq, then the APR doesn’t matter as much. Good point that PenFed also has excellent rates. Note though that 2.20% is new autos only. The used rate is 2.99%. I forgot to mention that we bought used. Had we bought new, we would have had another set of math: one can often choose between super low interest (e.g. 0%) through the dealer or whatever cash invective is being offered with a higher APR. In that case, we’d have had to have weighed the low long term interest vs. cash invective + DCU refi as we likely would have immediately refinanced. Yes in this game it helps to be good at math. School does pay off, kids 😉 On a side note, I’d love to hear your poker tournament story someday. Do you still play regularly or was that a one-off? Worth noting: method 3 would work with any local credit union or bank that has good auto rates…worth shopping around for that, too. Paying off a chunk of any big loan amount early will always make a huge dent in interest paid over the life of the loan. I, too, enjoy holding onto my money (or the banks’ money if I’m floating a nice-sized, fee-free balance transfer) & putting it in solid, near-guaranted yields that are higher than the 2.49% interest i may be paying. My CU gave me low 2% on my truck years ago also so this article relates well. Just a side note – UA elites can get either 25,000 or 50,000 UA miles when they purchase a new or CPO Mercedes. Just look under your elite benefits when logged in, print out the certificate, and take to the dealer with you. Definitely an added bonus if you’re already looking at buying or leasing a Mercedes. Nice! I didn’t know that. I wonder whether you could stack that with the $1K savings certificate from the Mercedes-Benz Platinum card? It would probably be too late for anyone who doesn’t already have that card as it won’t be around for another year to get the certificate at anniversary, but for someone who currently has the certificate I wonder…. Just a heads up for those paying a small portion for a new car on a credit card, I bought a new car three years ago, the dealer took $5000 on CC and assured me there would be no hard credit pull but there was. There shouldn’t by any credit pull unless you gave your Social Security Number to the dealer. If you weren’t financing (getting a loan) through the dealer, I don’t think they would have had any need for your SSN. Some dealers are slick and they’ll slide a piece of paper in that you sign allowing them to do a credit check so they can shop around for financing for you. You do have to be careful about reading what you’re signing/filling out. But there shouldn’t be any credit check for you to pay $5K on your credit card. What credit card has a high enough credit limit to buy a car? $12,500 is the highest I’ve ever had. This really varies from person to person — it’s not that one credit card has a higher limit than others, it comes down to what the bank is willing to extend to you with your credit score, income, etc. In growing my portfolio of cards, I for a long time found a mantra from Creditboards.com to hold true: higher limites beget higher limits. In other words, as I got my initial set of limits raised, I found myself getting approved for new cards with similarly high limits. Of course, that stops at some point when the bank reaches a maximum exposure for you. Some issuers (like Chase for example) will allow you to move credit from one card to another. For example, if you have two cards with $10K limits, you may be able to move $5K from one card to the other and have one card with a $15K limit and one with a $5K limit. Rules on that vary by issuer. I’ve heard of some people having combined credit limits like that to end up with a card with a limit in excess of $50K. If you go to Creditboards.com and click on “Creditpulls Database” in the top, you can look at the approvals that people report there and see what kind of limits they have gotten. You’ll see that it’s not particularly uncommon for people to get approved with limits between $20K-$30K when they have the credit profile to support it. If you’re then able to combine limits and/or get a credit limit increase now and then, it’s certainly possible to have a limit large enough to buy a car. On the other hand, that’s not possible for everyone. I bought 2 cars in the last 5 months and used a CC on both of them. I used an AMEX on both, but could have used a Visa or MC if I wanted to. I negotiated a rock bottom deal and when asked if I wanted to finance, I said no but I will be paying with a CC. Their policy was to allow for $5k max so i told them that I am ready to buy now with my CC or happy to go to a competing dealer across town. I told the salesman that if the floor manager or finance manager comes out of the back, I would leave immediately. “You are my salesman so you get the deal done for me or I will leave”. They wined a bit but did the deals. I bought $80,000 in purchased and got 1.5x on AMEX. Great to look at a bunch if complicated programs but as a salesman I always use an assumptive close and take the easier route. I bought my last 3 Mercedes using the AMEX MB Platinum and received 5x the points. So I earned a little over 1MM MR points. My dealer only allowed me to do this on purchases and not one pay leases as they said I would be double dipping on the financing. The first time they pushed back citing the credit card fee but I’ve been a loyal customer the last 5 years and referred many friends to them so they backed off on the $5k limit. I was in the market for a new Toyota Camry 2017 in another state (for my partner’s younger sister to drive till she goes to college, then we’ll take over the car). Managed to negotiate the price to what was paid by a friend ($19,000+ all in). They were willing to put $3,500 on my old Blue for Business. Then during the stage when I was talking with the finance guy I played hardball, I was willing to walk out. We finally came to an agreement for $10,000 on the card. I used plastiq to cover the rest. Out of curiosity, did you use Plastiq to pay $10K to the dealer directly? One should always determine the final out the door price of a vehicle before figuring how to pay. I figured the supposed invoice of the car I wanted. Then I contacted a dozen dealers around the country. They found what I wanted on their lots and the dealer willing to go the lowest below that (again, supposed, after holdback and other perks) invoice got the sale. I flew to LAS, had a free MLife promo stay, and drove my car home the next day. Saving more than 8% over others is worth more than finding a dealer willing to exceed any dealer-imposed limit. I will never negotiate in person again. I only go to the lot for test drives and final paperwork now. Congrats on getting a deal! I also negotiated the entire thing via email and agree that’s the way to go. Fundamentally I think it comes down to this–if you’ve negotiated well the swipe fee is just money you could have reduced the total cost of the car by. Remember as well that you don’t need to pay sales tax on this amount if it shows up as a dealer cost reduction as opposed to being included as a swipe fee. Unfortunately, with a crooked partners assistance, we tanked a business 20+ years ago and the resulting bankruptcy included AMEX, actually for peanuts. They seem never to forgive or forget so I’m always glad when articles include non-AMEX offers/options too. Thanks. – once approved, use the loan money from CU or bank to pay off part or all of the cc balance. can the last step actually happen? my understanding is that if a CU or bank agree to issue auto loan to you, then the check for that auto loan actually goes directly to dealership, i.e. you cannot cash it, am i right? or can you actually have the CU or bank write your name on that check? My suggestion: find the lowest price.. period. This reminds me the time someone said they buy toiletries at Staples to get 5x..
I’m certainly open to different perspectives and critique — these methods won’t be for everyone — but I don’t see your correlation. The whole point behind Method #2 and Method #3 being better than #1 is that you *can* negotiate the best price possible *and* earn thousands of dollars worth of miles. Neither of those methods relies on the dealer taking a cent on a credit card — either example shows how you could earn almost 30% of the purchase price in signup bonuses as compared to the example purchase price by creatively using credit cards. In my case, I did negotiate the best price possible. This post wasn’t about negotiating the price because that’s not really the focus of this blog — the focus was about how to earn the greatest rewards, which you can do after finding the lowest price. Why only focus on the price and not then double down and earn huge rewards? I don’t see the connection between that and buying overpriced shampoo at Staples for 5x. The biggest problem is trying to find a dealership which is willing to take that much on a credit card. I just took delivery of my new car in late December (Ordered in August). I tried multiple dealerships owned by different groups and all said $5k was it. BTW, Costco has an auto buying service as well. Decent pricing. I did better without it. Ironically, I have put down payments for many other people’s cars over the years on my card. My friends usually repaid me within 1-2 weeks and I got the miles. Worked for me. See method #2 and method #3 — neither rely on finding a dealership willing to take any money at all on a credit card. Who do you think ultimately pays the credit card fees if you pay by credit card? Well, with Method #1, the buyer does (as noted in the disadvantages of that method). Of course, the right signup bonus might more than mitigate that (see the Business Platinum example). In Method 2, you’re splitting them with the stores – but more than making up for that with 590,000 airline miles. In Method 3, Plastiq is. Nick, while I normally love your stuff, I think you left out a key piece of info in this article: the reason why car dealers place a maximum on what you can charge (usually a relatively low number, say around 5k max) is because most credit card purchases are unsecured, meaning they are not backed by collateral. This means that if you fail to pay, go bankrupt, etc. the lender (or dealer) has no recourse to take back your car. (As opposed to a car loan, for instance) No dealer will take that risk despite what you may hear from others. It makes no sense for the dealer. You can just imagine how many shady people would try to get a car for “free”! You should probably include this in your article or at least research this further, before your readers waste any time choosing a dealer based on how much they charge. Bottom line: It should be an added bonus and not be a factor at all in your purchasing decision. To clarify, when I say “ charge” I mean “ charge on a credit card” NOT “charge for the car”. Of course, the latter (ie the price) should be a primary factor in buying a car! 😉 Sorry for the initial confusion. True that most dealers won’t take the full purchase price on a car. That’s what makes the Amex Auto Buying program unique. But I didn’t take that route because I agree that the credit card shouldn’t influence the purchase — I wanted to be able to buy the car I wanted at the best price I could negotiate without needing the dealer to accept my CC. But I still wanted to earn CC rewards. That’s why I went with #3. There is no risk for a dealer to take a credit card, at all. That’s exactly why they are willing to pay the “swipe” fee to accept cards. The risk is at the card issuer, not the dealer. I did the Plastiq method. I was about to pay cash, but Lincoln had a 0% interest deal going on a 36 month loan so I took that. I pay $2,000 a month for my Navigator on an Amex that gives me 2 points per dollar (up to 50K, so that’s 4K points a month for a $50 fee. (1.2 cents per point). I also pay big ticket items on that card (vacation costs, taxes) until I hit the 50K max. If I happen to open a new card that has a minimum spend, I just swap out of the Amex into that card for a month or two (or three) and I’m pretty much covered. Buy or Lease a Mini Cooper for 25,000 Alaska Airlines Miles | No Mas Coach!